Elise and Richard Sivcovich of Ballwin, Missouri want everyone to know how proud they are of their daughter Caroline who graduated high school this year. 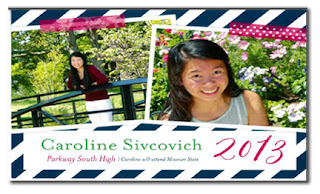 Caroline was adopted from China in 1996. She plans to continue her education, majoring in biology with a concentration in genetic research. Congratulations to Caroline. We wish you God's continued blessings!